Five years ago you’d have a hard time getting the guys here to recommend Rugged Ridge, but this top is light years beyond than what we’ve seen from them in the past. 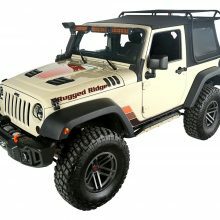 The Rugged Ridge Exo-Top is a great example of Rugged Ridge’s new focus on quality when it comes to their Jeep parts line. 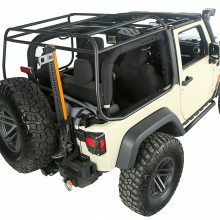 It is a replacement soft top that adds an integrated roof rack, capable of carrying 300 pounds, and it’s one of the best products to come from Rugged Ridge to-date. 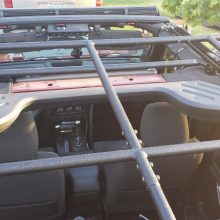 You can take off the top without having to take off the roof rack (unlike existing racks), it doesn’t leak, and it looks great. 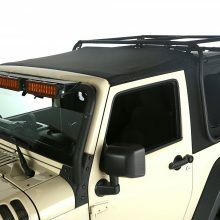 This top includes what Rugged Ridge calls a “Sun Slider”. By opening two latches, the top slides back like a traditional sunroof, providing some sun and open air. You don’t even have to get out of the Jeep to open the top. 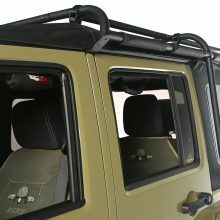 The Rugged Ridge Exo-Top comes with an external cargo rack that allows you to store all your gear safely. 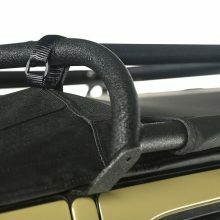 The roof rack secures with a series of Velcro straps, and helps the top itself keep it’s shape. 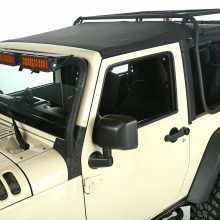 The roof rack is essentially the soft top frame. 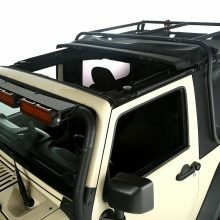 Externally suspended replacement soft top integrated with a roof rack – so you get two products for the price of one. Innovative Sun Slider retractable roof easily operates from the convenience of the front seat. Soft top operation without unloading gear. Multi-position top configuration not available in any other top system. Offers patent pending design with industry leading five year warranty. 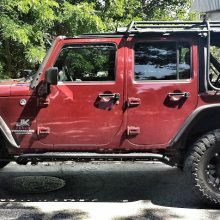 The Rugged Ridge Exo-Top is a superb top that looks great, and if you’re in the market for a cargo rack, and have the coin to afford it, then this is the way to go. 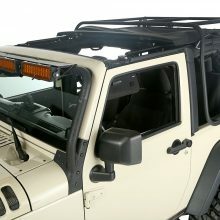 You won’t have to drill holes in the body of your Jeep, but you’ll still get a rock solid cargo rack. The Sun Slider is amazing – you can open the top up while sitting at a stop light, without any tools, this is perfect for getting some air after the rain stops.